Tomorrow’s vehicles will be more electrified, connected, automated, and shared compared with vehicles today. Modeling and control will continue to play a key role in making these vehicles safer, more efficient, and less polluting. In this talk, I will present my personal experience in applying advanced modeling and control techniques to several automotive applications, to improve their safety and energy consumption. The talk will end with future trend and remaining challenges. 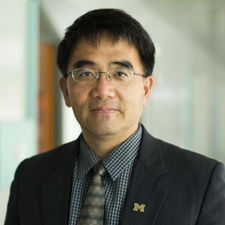 Huei Peng is the Roger L. McCarthy Professor of Mechanical Engineering at the University of Michigan and currently serves as the Director of Mcity, which studies connected and autonomous vehicle technologies and promotes their deployment. He received his Ph.D. in Mechanical Engineering from the University of California, Berkeley in 1992. His research interests include adaptive control and optimal control, with emphasis on their applications to vehicular and transportation systems. His current research focuses include design and control of electrified vehicles, and connected/automated vehicles.